Stange Facts. 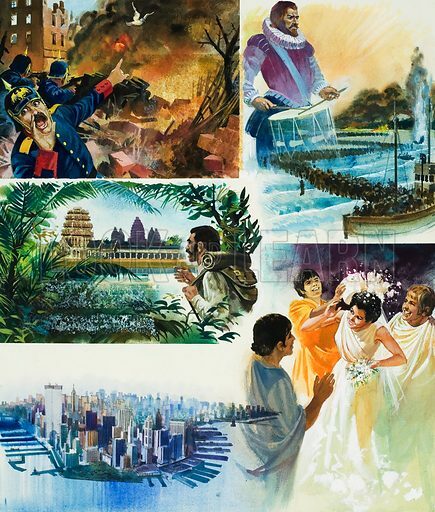 Illustrations depicting (from top to bottom): Drake's drum; carrier pigeons carrying microscopic messages from Paris; Angkor Wat; Manhattan Island; and the tradition of breaking a wedding cake over the bride's head. Original artwork for illustration on p40 of Look and Learn issue no 807 (2 July 1977). Lent for scanning by The Gallery of Illustration. Available worldwide for immediate download up to 3,688 x 4,338 pixels.